Researchers have used 835 annual tree-ring chronologies based on measurements from 20- to 30-thousand tree samples across the United States, Mexico, and parts of Canada to reconstruct a history of drought over the last 2005 years. Click on the above picture to view animation. Not enough is know about what triggers major droughts, yet they occur all across North America often having greater economic and social impacts than any other type of natural disaster. Losses due to drought in the United States alone average $6-8 billion each year, with a high of $39 billion for the three-year drought of 1987-89. Researchers from the Lamont-Doherty Earth Observatory of The Earth Institute at Columbia University have used 835 annual tree-ring chronologies based on measurements from 20- to 30-thousand tree samples across the United States, Mexico, and parts of Canada to reconstruct a history of drought over the last 2005 years. 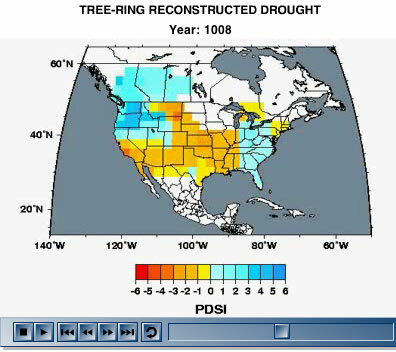 The resulting drought reconstructions have been organized into a North American Drought Atlas CD-ROM, the first of its kind, which maps year-by-year occurrences of droughts. The maps provide essential paleoclimate data with important applications to science, as well as policy, education, and history. “It is not yet possible to forecast droughts, but we can surmise a great deal from the paleoclimatic record about the future possibilities of droughts. When and where droughts have occurred in the past, at what severity, and for what duration are all indictors of drought patterns we may see in the future,” said Edward R. Cook, lead developer of the North American Drought Atlas, Director of the Tree Ring Laboratory, and Doherty Senior Scholar at the Lamont-Doherty Earth Observatory. The goal of this North American Drought Atlas is to improve and expand knowledge on North American drought severity and to catalyze innovative advances in the use of paleoclimate data with climate models to better understand the causes of drought. The resulting Atlas contains 2,005 annual maps of reconstructed droughts over North America, a full animation of those maps, and a time series plot of each reconstruction with associated plots of calibrated and verification statistics. The Atlas was created through the support of the paleoclimate programs of the National Science Foundation and the National Oceanic Atmospheric Administration. The Earth Institute at Columbia University is the world’s leading academic center for the integrated study of Earth, its environment and society. The Earth Institute builds upon excellence in the core disciplines—earth sciences, biological sciences, engineering sciences, social sciences and health sciences—and stresses cross-disciplinary approaches to complex problems. Through its research, training and global partnerships, it mobilizes science and technology to advance sustainable development, while placing special emphasis on the needs of the world’s poor.